Taken from http://www.bicycling.com – used in full, without any modifications and without their permission. Lately, it seems low-carbohydrate, high-fat (LCHF) diets are of greater interest among athletes.1 More and more elite and amateur endurance athletes are claiming there is an advantage to ditching the traditionally accepted high-carbohydrate, low-fat (HCLF) dietary strategies of the past in favor of higher-fat diets. Unfortunately, the realm of dietary intake for optimal performance is very gray, with few “black and white” answers, and the discussion of carbohydrate and fat intake for endurance performance is no different. Dietary intake can vary widely between athletes and is influenced by sport, personal preference, food intolerances, and the training cycle of an athlete. Accordingly, athletic success in the realm of endurance sport has been achieved by individuals following both a LCHF approach as well as a HFLC approach. To make matters even more confusing, there isn’t consensus among those most qualified to be providing sports nutrition advice. 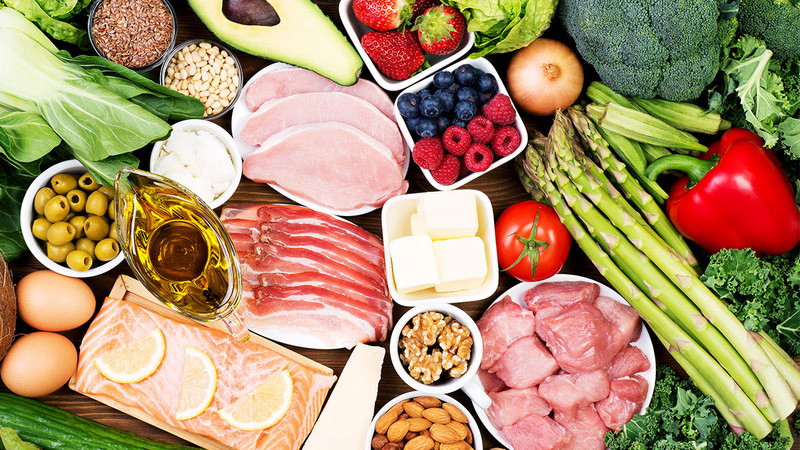 Some sports dieticians favor LCHF diets for optimal performance, while others rely on the “tried and true” benefits of the more traditional HCLF diet. This topic is of great interest to me, as I have had personal experience with both high-carbohydrate diets and low-carbohydrate diets. As a competitive amateur triathlete, I am always looking for ways to safely and effectively improve my performance. Alongside proper sport-specific training, optimal rest and recovery, and effective mental preparation, dietary habits represent a rather significant target area for performance improvements. Here, we’ll take a look at what the research says regarding LCHF diets and HCLF diets for endurance sport performance. We’ll also provide some general, albeit practical, recommendations for daily carbohydrate intake as well as carbohydrate intake during training sessions. Before I begin to dig deeper into the available research, let me first begin by differentiating between LCHF and HCLF diets. In most studies, researchers will typically have subjects consume both a LCHF diet (60 to 70 percent of caloric intake from fat) and a HCLF diet (65 to 75 percent of caloric intake from carbohydrates) in random order and perform a variety of exercise tests (primarily cycling tests) following each dietary protocol. One of the few studies that found a LCHF diet to be superior to a HFLC diet had five well-trained cyclists consume, in random order, a HCLF diet (74 percent of caloric intake) or a LCHF diet (70 percent of caloric intake) for two weeks. Cycling exercise to exhaustion at 60 percent of VO2 max (maximum aerobic exercise capacity) was longer after consuming a LCHF diet when compared to the HCLF diet. However, performance on the other two higher-intensity tests (time to exhaustion at 90 percent VO2 max and a 30-second all-out sprint) were not improved with a LCHF diet. One of the theories behind the proposed benefits of a LCHF diet is that this type of dietary manipulation allows an endurance athlete to alter the type of fuel that they rely on when exercising. The idea is to improve an athlete’s ability to utilize fat during exercise, allowing them to rely less on their limited carbohydrate stores during exercise and more on their nearly-limitless stores of fat (even the leanest of athletes still have a nearly limitless store of fat to draw upon during exercise). This should subsequently allow athletes to go much farther without “bonking” or “hitting the wall” — that unpleasant feeling of complete fatigue, exhaustion, dizziness, and lethargy associated with depletion of carbohydrate stores during prolonged, intense exercise. To some extent, this theory makes sense at first. Humans do have a very limited store of carbohydrates and a nearly unlimited store of fat to draw upon to fuel exercise. Humans also rely heavily on fat to fuel exercise at lower-intensities (peak fat metabolism during exercise occurs around 45 to 65 percent of VO2 max), with the reliance on carbohydrates to fuel performance increasing with an increasing exercise intensity. In other words, fat utilization is highest during low-intensity aerobic exercise, such as an easy cycling, running, or swimming session. However, as the speed or pace of that training session increases, so does that athlete’s reliance on carbohydrate metabolism to fuel their performance. The reason for this increase in carbohydrate metabolism with increasing exercise intensity is simply due to the speed at which carbohydrate metabolism can provide energy to the working muscles. Fat metabolism is a much slower process than carbohydrate metabolism, making fat the ideal fuel choice when the exercise intensity, and therefore, energy demand, is low. It has been clearly demonstrated that athletes following a LCHF diet will indeed increase their ability to utilize fat at any given exercise intensity.1,3,4,5,6 However, this also comes with a decreased ability to utilize carbohydrates during exercise, leaving an athlete with a reduced capacity to perform higher-intensity exercise.1 This may explain why research shows a decrease in performance of high-intensity exercise tests (for example, cycling to exhaustion at 80 to 90 percent of VO2 max or during high-intensity sprints) when following a LCHF diet, but unchanged performance during lower-intensity exercise tests (for example, cycling to exhaustion at 60 percent of VO2 max). It seems, based on available research, that a LCHF diet may not be the optimal choice for most endurance athletes. The improvement in fat metabolism simply may not outweigh the risk of reducing one’s capacity to metabolize carbohydrates during exercise and competition. However, we must view this information in context. As I mentioned previously, there is very little research comparing LCHF diets and HCLF diets for sports performance, and the research that has been completed suffers from many limitations that make it difficult to draw sound conclusions. These limitations include very small samples chosen for the studies (typically five to 16 subjects), the inclusion of primarily well-trained athletes in these studies, and a focus on cycling performance measures. This makes it hard to completely throw the LCHF diet out the window. There simply isn’t enough research yet to discount this dietary strategy for endurance performance. Additionally, there may be cases in which a LCHF diet may be beneficial for performance in some athletes. A recent literature review on this topic suggests that a LCHF diet may be more beneficial for reducing body fat when compared to a HCLF diet of similar caloric intake.1 This may simply be due to the fact that a LCHF diet improves the body’s ability to metabolize fat during rest and during exercise, but it’s difficult to tell exactly why this is the case as there isn’t enough research available. Furthermore, there may be a subgroup of athletes in which a LCHF dietary approach may be beneficial, including ultra-endurance athletes who compete at a relatively low exercise intensity for a very long period of time.1 For example, athletes competing in multiple-day running or hiking competitions in which the majority of competition takes place at less than 65 percent of VO2 max may benefit from an improved ability to metabolize fat, since much of their exercise during competition takes place below the intensity at which peak fat metabolism occurs. Even these endurance athletes will still need to consume carbohydrates during competition for optimal performance, albeit at a relatively much lower level than an endurance athlete competing in a single-day event like a short-course triathlon or a marathon. Finally, a LCHF dietary strategy may make sense for athletes who are sensitive to carbohydrates.1 For some, consuming high amounts of carbohydrates causes gastrointestinal (GI) discomfort. This can be a significant factor in performance, especially for endurance athletes, so it may simply make sense to consume a higher-fat diet for these individuals. To summarize, there truly is no “perfect” or “ideal” dietary approach for endurance athletes. Although the current research seems to indicate that a more traditional, HCLF dietary approach is better-suited for overall endurance performance, research often doesn’t take into account individual differences between athletes. Therefore, while most athletes may perform best on a moderate- or high-carbohydrate diet, some may perform best on a low-carbohydrate diet, and some may perform best on something between these two approaches. At the end of the day, diet is very personal and can vary widely between athletes. Scientific research can often give us insights into what seems to be best for large groups of people, but it’s up to each individual athlete to find what works best for them. If an athlete does wish to experiment with a new dietary approach or wishes to tweak their diet, I would suggest doing so under the guidance of a Registered Dietician, preferably a sports dietician, as these professionals are most qualified to help guide an athlete’s dietary choices. For those interested in the current sports nutrition recommendations for daily carbohydrate, fat, and protein intake, as well as carbohydrate intake during exercise, see Table 1 and Table 2 below. Burke, L. M. (2015). Re-examining high-fat diets for sports performance: did we call the ‘nail in the coffin’too soon?. Sports Medicine, 45(1), 33-49. Paoli, A., Grimaldi, K., D’Agostino, D., Cenci, L., Moro, T., Bianco, A., & Palma, A. (2012). Ketogenic diet does not affect strength performance in elite artistic gymnasts. Journal of the International Society of Sports Nutrition, 9(1), 34. Burke, L. M., Angus, D. J., Cox, G. R., Cummings, N. K., Febbraio, M. A., Gawthorn, K., … & Hargreaves, M. (2000). Effect of fat adaptation and carbohydrate restoration on metabolism and performance during prolonged cycling. Journal of Applied Physiology, 89(6), 2413-2421. Gaesser, G. A. (2015). Carbohydrates, performance and weight loss Is low the way to go or the way to bonk?. Agro Food Industry Hi-Tech, 26(6), 35-38. O’Keeffe, K. A., Keith, R. E., Wilson, G. D., & Blessing, D. L. (1989). Dietary carbohydrate intake and endurance exercise performance of trained female cyclists. Nutrition Research, 9(8), 819-830. Manore, M. M. (2005). Exercise and the Institute of Medicine recommendations for nutrition. Current sports medicine reports, 4(4), 193-198.